We bought rest assured pads when we went a couple of years ago. Back there you could order them before hand and they would be put in your stall by the time of arrival. Looks like they will be there again this year. Its my first year too! I have my stall mats ordered. For $100 its peace of mind for me. I plan on putting several bags of shavings on top and she will be in her cloud boots too. Anything to keep her comfortable for the 5 days we will be there. Yes. I use the Elite Stall mats. They are secure, thick, and dont move around or get destroyed. they put them in and then you check out and they deal with them. Also Cheaper. I think $80 per stall. I just reserved mine. 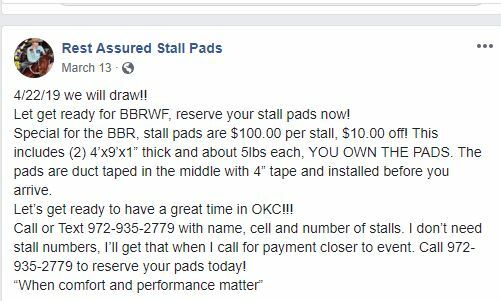 Rest Assued stall mats will be there - $100 and you get to KEEP them. They are super light and reusable. im not going, but I’m trying to find someone to bring me back a set of mats. A lot of places we go I’d like to put them down as my guy lays down a lot. Comparing cost,...I think i would buy my own snap and lock stall mats. We do not do mats. We put down 5 bags of pelleted bedding which will pack on the bottom of the stall. On top of that we use 3 or 4 bags of pine flakes. The pelleted bedding is heavier and will stay on the bottom. We have never had s horse sore up using this combo over the concrete floors. A couple of years ago when the big storm blew through, our aisles were flooded, but the pelleted bedding kept the water from getting into our stalls.